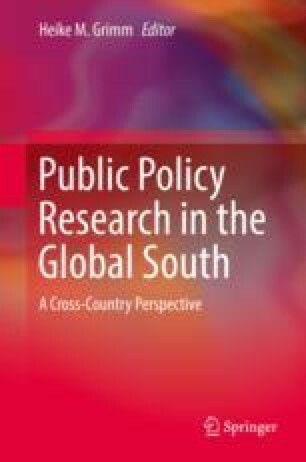 The objective of this book is to present topical research about the emergence of public policy as a field of research and as an academic discipline in countries of the Global South to enhance the portfolio of academic literature beyond the Global North’s perspective and paradigm. The volume wants to fill an academic gap by focusing on public policy research in the context of the Global South where transformations take place rapidly while knowledge about the role, tools and theories of public policy making is still rare although crucial for development. The conditions of countries in the Global South are often generalized which is often misleading and even debatable if applied to the Global South in its entirety. In this book, it is shown how multifaceted the conditions are in places of the Global South and how important it is to contextualize them before drawing lessons for public policy agenda setting and policy making. Cognizant of the deeply interdisciplinary nature of public policy, the book considers aspects of history, economics, political science, governance, sociology, and law as components of public policy theory development. It investigates how these theories have influenced policy making and, more specifically, agenda setting in countries of the Global South. The theory-driven, empirical contributions cover a wide range of policy issues such as democratization, migration, integration, corruption, economic development, environment, education, and entrepreneurship.